Be our guest in our spacious 7 Springs Mountain Villa! Our 4 bedroom 3.5 bath Villas townhouse sleeps 12 and offers top notch comfortable rental accommodations with all the amenities of home! No pull out sleep sofas! No sharing a double or full size bed either! Bedding is either king, queen or twin size for sleeping comfort. High speed wireless internet is included and the kitchen is fully stocked for all your cooking needs. Linens and towels are supplied too. Great outdoor space in the summer with large propane grill and plenty of seating. Free use of outdoor pool and we are steps away from the Seven Springs golf course club house. The Mt. Villa properties are conveniently located less than a mile from the Seven Springs main gate in the Seven Springs Mountain Villa community near the outdoor pool and golf course. Seven Springs offers the perfect location for your family or group getaway to the mountains any time of year. Plan your winter or summer vacation, retreat, family reunion, golf outing or relaxing getaway now! 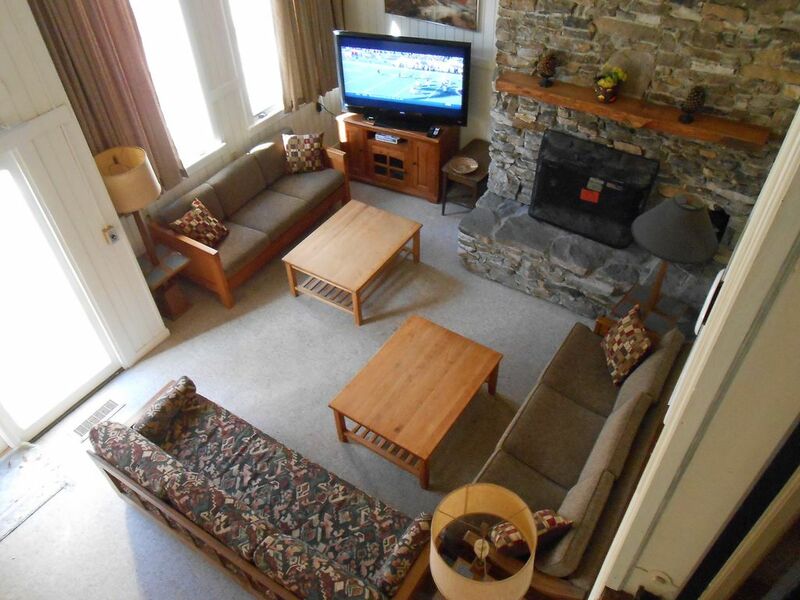 No matter what the size of your group, we have the lodging for you! We have a 5 BR 4 BA townhouse that is right next door to the 4 BR townhouse. Perfect for large group events. For smaller groups, choose our 3BR 2 BA condo that sleeps up to 8 - vrbo 631480. No pets and no smoking. Security deposit will be forfeited for failure to comply. Must be 21 years of age with valid government ID/drivers license to rent. Two night minimum pricing for all rentals. Note: Pricing is subject to change. Minimum rates apply. First 2 night minimum on any Monday - Thursday - rental. Please contact us to confirm pricing. VRBO now collects and remits all PA taxes. Located in the Mountain Villas at 7 Springs Ski Resort. Free shuttle provided to resort 24/7. Park your car and ride the shuttle! Central air for summer use. No need to bring sheets - we provide them for all beds. Park in front of unit. Plenty of extra parking available on Mt. Villa property by pool and golf course clubhouse. No need to bring towels - we provide them for 12. Great seating for large groups to gather and socialize. Three couches, two large chairs and 2 large coffee tables. Large 55 inch flatscreen TV and dvd player, and 2nd full size fridge. 4 BR townhouse - 2 FULL size refrigerators in property! Who can't use more refrigerator space? Newly renovated kitchen with brand new appliances, counters, under counter lighting, and flooring. Full array of cookware, pots and pans for in house meal preparation. Picnic table and chairs for summer use. Take the free shuttle to the slopes! The shuttle runs year round 24/7 and the stops outside of the townhouses. Yes! We are located at the Seven Springs golf course! Outdoor pool is free to use in the summer. The place is nice and roomy. The condo and kitchen is well equipped. There is plenty of space and it is very convenient to get down to the slopes. A shuttle comes frequently to take you to 7 Springs or you can drive a short distance. Everything you need for a nice ski weekend. We stayed at this property for a weekend ski trip and it was such a perfect fit for a group of 10 (but it could comfortably fit more). The house was outfitted with everything we could possibly need, including ample paper products and soaps and a fully stocked kitchen with all types of gadgets (coffee maker, blender, waffle maker) and plenty of cups/mugs/plates/pots/pans to go around. The beds were very comfortable and there were enough bathrooms for everyone. Donna was super responsive to any question we had and made sure we had everything we needed. We would definitely rent one of her properties again. Location is close to slopes. Everything was as stated online. Would highly recommend. The owner was a great help and replied to text right away. Had wonderful time ! Place was great! Owner very easy to deal with . We had 4 adults and 5 young kids - the place was plenty big enough for all of us. The house is very well stocked and the owner is super nice and great at communication. Loved the shuttle - it really makes a difference with 9 people going back and forth to the lodge. The house is a bit dated inside, but we expected that from the pictures. Overall, had a great time. Nice location. Great pool area. Roomy townhouse but very dated except for the kitchen. Kitchen was well stocked for cooking. The loft area was very hot even with the fan on. Holiday rates vary depending on the number of nights. Contact owner for more details or pricing. Rates are subject to change until reservation is confirmed. Cancellation Policy: Payment refunded in full with notice 60 days prior to arrival date. Cancellation policy: 100% refund if canceled at least 60 days prior to arrival dates. Payment by guaranteed check for rental. Personal check for refundable security deposit is not cashed unless damages are found. Three night minimum for holiday weekends. Two night minimum for non holiday weekends. Minimum rate for M - Th rentals. Contact us to confirm holiday weekend pricing.